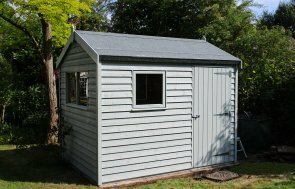 This Superior Shed was installed for use as a large potting shed. The exterior was finished in a combination of grey slate composite tiles on the roof, together with shiplap cladding, coated in Sage Valtti paint. The interior featured oak-faced ply lining and insulation. This luxury shed forms part of our broader collection of garden sheds. Our garden sheds stand out among the variety of wooden sheds available on the market today. Handmade to order in Norfolk, each custom built shed is designed to meet our customer requirements. Each of our garden sheds offer something unique in terms of style, size and design features and each building we manufacture comes with delivery and installation included as part of our complete service. 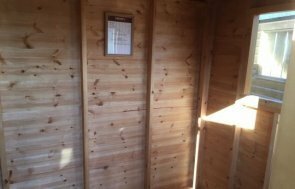 Whether you need a storage shed, a secure workshop, year round cabin or hobby room - we've got the right garden room for you. I’ve been meaning for the last week to write praising Cranes to the skies and telling you just how thrilled we are with our beautiful new building... ...We are SO impressed with all the members of staff we've had the pleasure of meeting over the period we've been planning this - without exception everyone in Cranes has been helpful, considerate and cheery and nobody told us that to try and get a top of the range biuilding into a space without proper access was foolhardy - they just made sure it happened. It's truly wonderful in this day and age to encounter such superior, faultless and courteous organisation and implementation. Many congratulations and thanks to you all. All of our garden sheds are long-lasting, having been built with the best FSC® certified timber. The Superior Shed however, is notable for how robust it is, making it ideal to store a large amount of tools and equipment. Along with sheds, we also offer a vast range of other garden buildings including summerhouses, garden rooms, garden studios and greenhouses. For a look at our full range, use the link below.